Let these three promising businesses keep your portfolio warm this month. The autumn leaves have fallen, and temperatures are dropping fast. But don't think for a second that our zeal for finding fantastic stocks has cooled. Steve Symington (Universal Display): As the industry leader in phosphorescent organic light emitting diode (OLED) technology, Universal Display Corporation makes money by licensing its IP and selling OLED materials for use in cutting-edge OLED displays made by the world's leading original equipment manufacturers. In fact, UDC's tech is already featured in the displays of billions of smartphones and tablets from the likes of Samsung, LG, and Apple. LG Display, for its part, is in the early stages of ramping its own large OLED display manufacturing capabilities, with the aim of quadrupling sales of its high-end OLED TV units to 10 million in the next three years. After all, thanks to the fact that pixels in OLED displays emit their own light and so don't require a backlight, they not only provide superior color and contrast to their LCD counterparts, but they can also be made rollable, foldable, and even semi-transparent. And that's not to mention the potential for OLED lighting products to disrupt another multibillion-dollar industry down the road. Collectively, these trends will pave the way for OLED to become more pervasive than ever in the coming years -- an encouraging long-term view that Universal Display management highlighted in the most recent earnings call last week. However, Universal Display shares also plunged more than 20% on the heels of that earnings report -- albeit after soaring almost 30% in the few days leading up to it -- after the company revealed that a ramp-up in OLED demand simply wasn't as fast as originally anticipated to start the second half. But our market hates being told to hurry up and wait, even though nothing has changed with regard to Universal Display's enviable long-term runway for growth. So I think the pullback offers a perfect opportunity for patient investors to open or add to their positions. Anders Bylund (TTM Technologies): One of the world's leading makers of printed circuit boards (PCBs) is a tempting buy right now. Share prices have plunged 33% over the past three months, centered around weak revenue guidance for the fourth quarter. TTM's industrial, networking equipment, and automotive clients are steaming ahead with rising PCB orders and solid guidance of their own, but the smartphone sector is lagging behind its usual pre-holiday surge. Investors ran for cover when that tidbit was announced, dropping TTM's share prices as much as 17% lower the next day. However, TTM's management provided a fairly clear explanation of what's going on behind that modest sales guidance, and I think it all makes sense. First, this year's collection of flagship smartphones was announced a bit earlier than usual. That's why TTM's third quarter crushed Wall Street's sales targets, having received some of the business usually reserved for the next period a few weeks earlier. 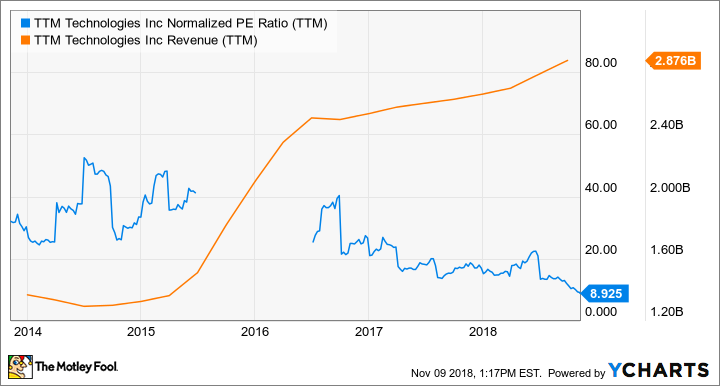 Chris Neiger (Apple): Some investors weren't impressed with the fourth-quarter results Apple released at the end of October, but I think they're missing the bigger picture of Apple's phenomenal fiscal 2018 results. The iPhone maker brought in $266 billion in sales for the full year, a 16% increase year over year. As impressive as that revenue growth is for a company of Apple's size, the company's 29% year-over-year jump in earnings per share is even better. That jump was fueled, in part, by $73 billion in share repurchases through the year -- showing that Apple knows not only how to sell devices but also to bring more shareholder value. For the skeptics out there, who might point out that Apple's iPhone sales were flat year over year in the fourth quarter, I'd say to check the device's revenue numbers. iPhone brought in $167 billion in fiscal 2018, up 18% year over year, thanks to the popularity -- and higher price tag -- of the iPhone X. The device, followed by the new XR and XS, has proved that Apple can command higher price tags for its flagship device and reap the benefits. If that's enough to get investors excited about Apple again, then consider that the company earned $37 billion from its fast-growing services segment, up 24% from last year. Apple's only recently begun focusing more of its attention on services, and it's likely that the company is still just getting started in this space. For investors looking for a great tech stock that continues to deliver huge gains for its shareholders -- Apple's stock is up 18% over the past 12 months -- this tech giant is still a great bet. We can't guarantee that these three tech stocks will go on to deliver outsize returns. But for investors willing to bet that the challenges for Universal Display and TTM Technology are both near-term in nature, and for those who can recognize Apple's immense earnings power, generous capital returns, and its ongoing shift to higher-margin services, we think buying them now will yield more than satisfactory results in the coming years.